Bolivian Telegraph Stamps of the world. they never passed into the hands of the public. Further information is required. referring to them as "Telegraph Stamps of 1906" although I suspect they may have been earlier. the American Bank Note Co. These have seven values up to 1B. They appear to have got off to a rather unfortunate start. About 1876, THE WEST COAST OF AMERICA TELEGRAPH COMPANY had a cable laid between Valparaiso (Chile) and Lima with landings at La Serena, Caldera, Antofogasta, Iquique, Arica and Mollendo. At the time Antofogasta was Bolivian, while Iquique and Arica belonged to Peru. According to Historia-de-Las-Telecomunicaciones-en-Bolivia Liger de Libessart who, on behalf of the Telegraph Society, made the first proposal to the Government to build a telegraph line at their own risk to join the main cities of the country. Later, the first telegraphic lines were from Antofagasta to Caracoles, property of the mining industrialist D. Marco Antonio Andrade. The War of the Pacific (1879-83) changed all that. Antofogasta has since belonged to Chile, along with all the rest of its coastal territory. The first public telegraph offices opened in 1881 in La Paz, Desaguadero and Puerto Pérez, La Paz. Humberto Villanue invented communication systems called Duplex and Triplex, with which traffic was streamlined, since three operators could simultaneously transmit on the same line. Víllanue entered as a telegraph messenger in Cochabamba, at the age of 11. 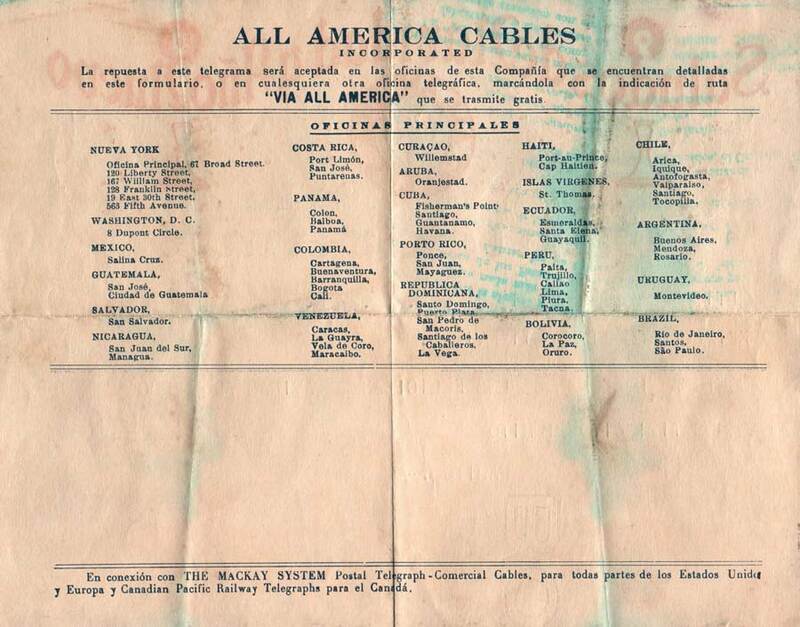 A 1917 telegram of All America Cables lists their stations in Bolivia as being in Corocoro, La Paz and Oruro. In 1920 there was a successful strike by telegraphists the city of Sucre demanding payment of their salaries, delayed by more than 6 months. June 19 has since been celebrated as the "Telegraph Day". #1 showing the known stamps of the set as specimens. Prices for punctured specimens as illustrated. Normal mint are unknown. seen no trace of H8 or H9 in any form. Not even the colours are known. There is therefore no evidence that the 2B and 5B values ever existed. do myself, for want of copies without overprint. In my experience even these are quite rare. so the unlisted ones are presumably came later than that. — Images courtesy of Rolf Lamprecht. 'Transacciones / 2 Centavos' in black (Forbin 30 and 31). Can anyone provide scans of Forbin 30 and/or 31 ? but unlisted by Forbin. — Images courtesy of Rolf Lamprecht. As I understand it, these were never issued without overprints, and none above 50c were issued at all. There is currently (June 2014) on Delcampe, an Exhibition collection of telegrams sent (primarily) during the Chaco war. Communications were very important at this time and a number of different telegraph seals were used. Some examples are shown below, courtesy of Marcelo Trejomovich (Corpmet on Delcampe). Simple red seal, courtesy of Marcelo Trejomovich (Corpmet on Delcampe) and my reconstruction. Image courtesy of Marcelo Trejomovich (Corpmet on Delcampe). Perforated dark green and red seal (1935) with La Paz imprint, courtesy of Marcelo Trejomovich (Corpmet on Delcampe) and my reconstruction. Imperf. green seal (1934-7), courtesy of Marcelo Trejomovich (Corpmet on Delcampe) and my reconstruction. Part-perf. red seal (1934), no apparent imprint, courtesy of Marcelo Trejomovich (Corpmet on Delcampe) and my (attempted) reconstruction. Radiogram with part-perf seal (1937), courtesy of Marcelo Trejomovich (Corpmet on Delcampe) and my reconstruction. Radiogram with half a seal used as a seal (1934), courtesy of Marcelo Trejomovich (Corpmet on Delcampe). Alternatively you can view the latest page for Bolivia.